Celebrating 30 Years of Pet Portraits! Prints, Cards, Cushions, Keyrings, Mugs and Much More! Book an apointment at The Studio. 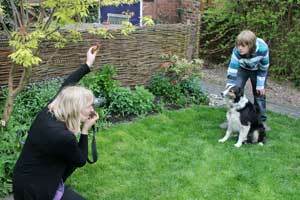 Bring your pets to us to have your pets photographed for your portrait. It is sometimes possible for Christine to Visit your home (or stable) for a photshoot, please enquire for availability. I will take a selection of photos - With my experience I have techniques to photograph even the most difficult pets - together we will choose your favourite for the portrait.